February is the month to clean out wood duck nest boxes to ready them for wood ducks that normally return in March. This task usually requires venturing out on frozen ponds or wearing hip waders to reach the boxes located over water. Wood ducks use the boxes for egg-laying and incubation for 28 to 37 days beginning in mid-March. After hatching, the day-old fluffy ducklings jump out of the hole and follow their mother toward water. Since they do not return to the nest boxes, other wildlife may move in. When you open the boxes to clear out eggshells and worn-out wood chips from last year’s occupants, you may be surprised to find a bird inside. 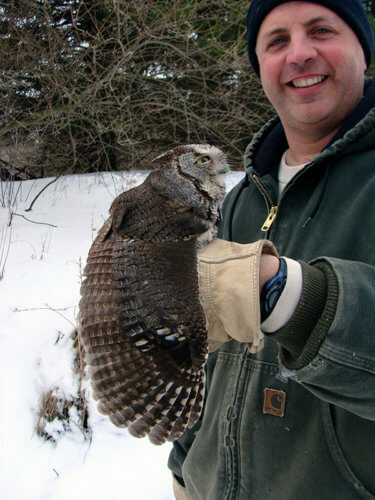 But not just any bird – you may find an Eastern screech owl. During the winter, this 6-inch-tall to 9-inch-tall owl roosts in empty boxes or finds natural cavities in trees. On warm winter days, the owl may sit in the entrance hole sunbathing with fluffed breast feathers. If you don’t encounter an owl, you may discover evidence of their presence such as pellets they coughed up or feathers from the songbirds they ate. Pellets contain indigestible bones and fur of small mammals the owl consumed. 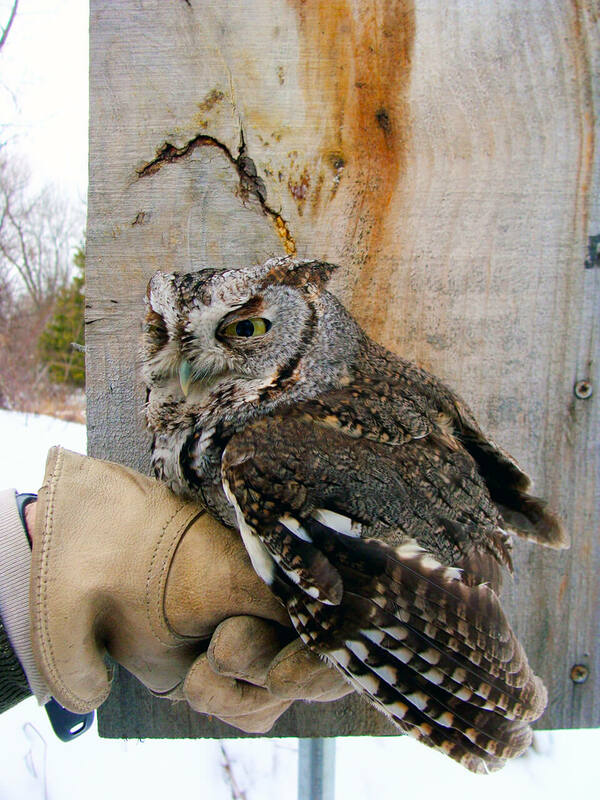 Since screech owls change roosts often, they may be sleeping in nearby “evergreen hotels” such as white cedar, spruce or juniper. Screech owls are monogamous; when one dies, the other will court another mate. Or they may “divorce” if nesting attempts are unsuccessful. In late April or early May, the pair chooses a nest site – old woodpecker holes, bird boxes, tree cavities from storm damage or holes enlarged by squirrels. Owls do not add nesting materials and will lay four to five all-white eggs on whatever is already there. The female incubates eggs alone for 21 to 30 days, but her mate brings her food every night and roosts within 6 meters of her during the day. After the nestlings hatch, the male continues bringing food to the family for 30 more days. Fledglings stay with both parents for eight to 10 weeks longer, learning how to hunt and roosting together in a variety of locations. Owls hunt mice, shrews, songbirds, large insects and snakes. Find plans for many sizes of nest boxes at nestwatch.org. Eastern screech owls are the only owl species with two color variations. The rufous phase shows rust, black and white feathers, while the gray phase wears grayish-brown and white, both in the same cryptic pattern. They raise the ear tufts and stretch the body when camouflaging themselves against deciduous trees. When threatened, the ear tufts get pushed back and the yellow eyes open wide. When relaxed, the body is fluffed and ear tufts are slightly erect. Both sexes make many unusual sounds. People who hear the “screech” of this owl may think they’ve heard a ghost. This piercing call indicates an upset owl is defending its nest or youngsters by flying at a predator. They make a monotonic trill to communicate with their family. They use the whinny call when defending their territory against other birds. Screech owls give a low-pitched soft hoot when alarmed or a loud single bark when ready to attack. To observe screech owls, arrive quietly at the habitat before sunset. They wake and start to stretch, preen and scratch 10 to 25 minutes before flying out at dusk. They bathe at shallow edges of creeks or ponds, then sit nearby to preen. When hunting, they usually fly within the tree canopy and make a U-shaped dive before landing on a branch.